You can see the full story here. For more details on Mayo Clinic’s social media platforms and how you can get involved, see 10 Ways You Can Use Mayo Clinic’s Social Media Tools. Alltop.com is a Web site that enables its users to browse news headlines and lead paragraphs of stories on topics (or from news sources) that interest them. So, for instance, you can go to the Alltop page on topics ranging from Accounting to Zoology, or on health topics such as Acne, Nutrition, Prostate Cancer or Women’s Health. And there are aggregated pages for all the Web feeds from CNN, Fox News, MSNBC and the New York Times, as well as the Washington Post, CBS News, USA Today and the Wall Street Journal. You might want to bookmark or “favorite” this page as a convenient way to scan Mayo Clinic news in one easy place. It’s also listed among the links in the right column of this blog. Lee Aase (@LeeAase) is Mayo Clinic’s manager for syndication and social media. 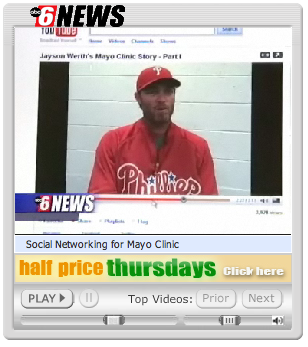 In previous “Social Media Saturday” posts I’ve introduced Mayo Clinic’s Facebook page and YouTube channel. 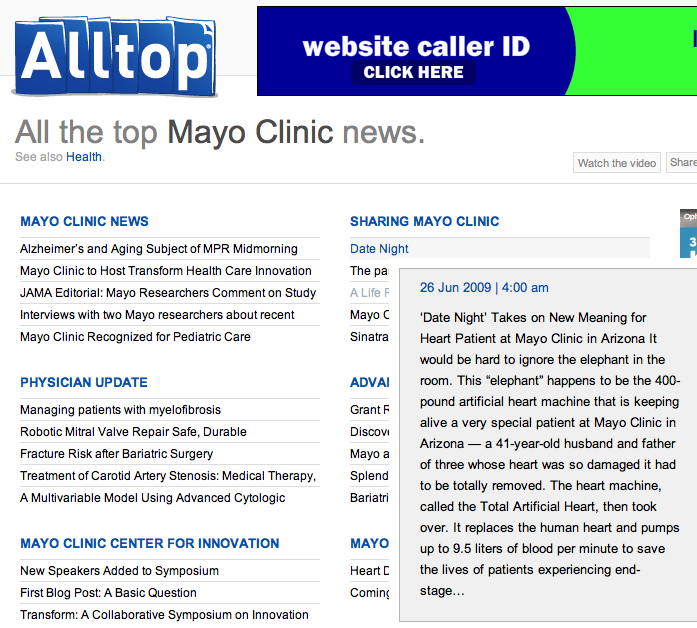 Those are Mayo Clinic’s longer-established social networking platforms, and like the Sharing Mayo Clinic blog they have significant potential for sharing information, enabling patients and staff to make connections and bringing the worldwide Mayo Clinic community together. Twitter is another popular and rapidly growing social site for making connections and spreading information rapidly. You’ve probably seen a lot about it in the news recently. YouTube now features Twitter among its ways to share videos with friends. Yesterday’s New York Times had an article about celebrities “tweeting” (the verb for Twitter activity), and ABC News has a similar story. Mayo Clinic’s Twitter account has been active for about a year, established well before all the recent hype. 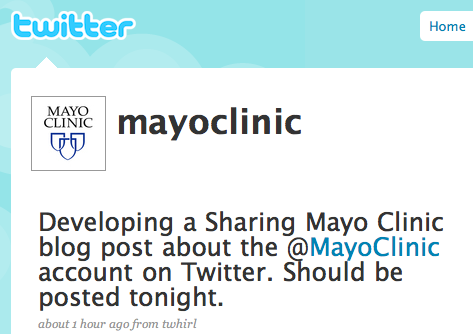 Until now it has mainly provided a way for Twitter users to get updates on the latest Mayo Clinic news. But the rapid growth of Twitter’s user base now makes it potentially much more useful for connecting the Mayo Clinic community.